Organized and operated by volunteers, the Garden District Farmers’ Market is located on Milwaukee’s south side at the northern entrance of the Milwaukee Green Corridor project. The Green Corridor area is designated by the district to showcase a wide variety of sustainable projects that ultimately seek to improve environmental performance, attract business development, raise public awareness and support regional growth. When it came time to construct a new parking lot in the fall of 2014, the farmers’ market seemed like the perfect place to incorporate green technology. However, lack of funding for the volunteer run nonprofit proved to be a sizable barrier. Belgard was glad to lend a hand to support some of Milwaukee’s green thumbs. Bryan Simon, owner of Simon Landscape Company and the chair of the Milwaukee Green Corridor project, had a vision to utilize a Belgard Permeable Interlocking Concrete Pavement (PICP) system in the construction of a 15,000 square foot parking lot adjacent to the farmers’ market. The parking lot’s PICP system includes a water harvesting system that overflows into a storage reservoir for irrigation of the orchard and hoop houses. Water harvesting with a Belgard PICP system utilizes a free resource to reduce municipal water supply costs, while complying with regional stormwater management guidelines. The water can be held in a long-term storage reservoir or flow into a rain garden, and ultimately be used for irrigation, washing, or other non-potable applications. In the past, Simon explained that landscape designers developed plans for shedding water from sites so it would not soak into the soil. The property owners then bought water for their lawns, trees and gardens. However, rain is optimal if is stays where it falls, seeping into the ground and watering the grass, plants and trees in that area. Impervious surfaces like buildings, parking lots and roads prevent rain from infiltrating back into the ground. In contrast, Belgard PICP is fundamentally a large-scale infiltration gallery with a drivable surface course over top. The open graded base and subbase aggregates have approximately 32% and 40% open space respectively, providing for temporary water storage. Since these are the same aggregates used for railway tracks, they are more than capable of supporting vehicular loads. While Simon was confident his idea of utilizing PICP was ideal for the parking lot and would ultimately save the organization money, the upfront cost of the project was more than the organization could afford. 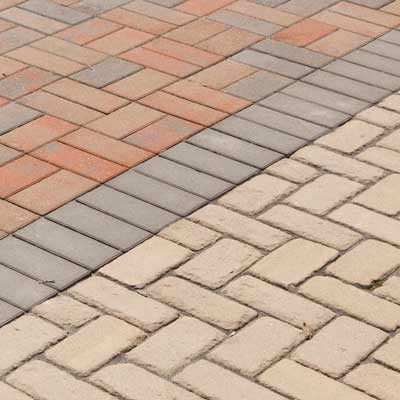 In addition, multiple municipal groups were involved, and the permeable pavers were a new concept to Milwaukee. The parking lot land is owned by Milwaukee County and leased to the nonprofit Energy Exchange. The project was awarded a Milwaukee Metropolitan Sewer District (MMSD) Green Infrastructure Grant. Since the grant funds are not received until the project is completed, the City of Milwaukee’s DPW provided gap funding to pay for the materials and labor that was not donated. This funding was absolutely crucial in allowing the project to move forward on schedule. Simon singled out a number of individuals who helped make the project a reality. Local Alderman, Terry Witkowski, was integral in designating the Green Corridor and opening the door to this project. Mayor Tom Barrett and his office embraced the PICP technology, not only in the Green Corridor, but also throughout the city and the district. Commission of Public Works Ghassan Korban approved the temporary funding, and the MMSD provided the major grant. Matt Howard, Director of Sustainability for the Office of Environmental Sustainability, and County Supervisor Jason Haas also played important roles in the project. 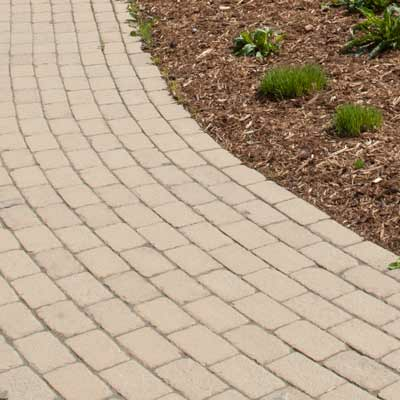 After funding was secured, the project team chose graphite colored Belgard Aqualine™ Series L-shaped multi-cobble permeable paver. Economically sound and surpassing all EPA stormwater requirements, Aqualine delivers results in both cost-effectiveness and long-term durability in harsh climates, particularly those with extreme freeze/thaw cycles. Under the pavers, a two-foot storm storage was installed to capture the water and pipe it to a 10,000 gallon aqua block system. The water overflows into a storage reservoir to be used to irrigate the orchard and hoop houses adjacent to the farmers’ market. The most popular feature of the grounds, a babbling stream, is also fed by the harvested rainwater. Multiple projects are on tap in the near future, including the 175,000 square foot Drexel Town Square, which is in construction over the dismantled Delphi automotive and aviation electronics plant. The Delphi site is considered a brownfield site, meaning the soil is contaminated and requires remediation. PCIP will be utilized in this project for its stormwater management capabilities and improvement of groundwater quality through filtration of total suspended solids.